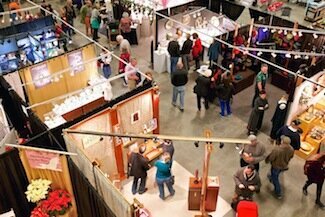 You’ll find unique works of art and fine craft from more than 100 contemporary fine craft artists who have travelled from across North Carolina and the U.S. to the heart of downtown Raleigh. Our handcrafted artisan shopping experience also includes dynamic artist demonstrations and live music. Look for updates to the demo and music schedule in August 2018. Mark your calendars for our 2018 Carolina Artisan Craft Market, November 2 – 4, in the Raleigh Convention Center Exhibit Hall C! 2018 marks the 49th year of the Carolina Designer Craftsmen Guild’s annual November event. All ticket sales benefit this local nonprofit and host! The Carolina Artisan Craft Market is a trusted resource for art collectors and first-time buyers looking for the finest contemporary and traditional craft being made in America. Fine craft artists present a striking variety of glass, ceramics, wood, both wearable and decorative fibers, metal, leather, basketry, printmaking and mixed media, as well as one-of-a-kind handmade furniture and both precious and semi-precious jewelry. A rigorous two-step jury selection process attracts emerging and career craft artists who are presenting craft at the highest level – reflecting a mastery of technique and originality of design. In addition to new and emerging provisional member artists, we welcome back our juried Exhibiting Artist Members as well. The images below represent the work of Exhibiting Artist Members and provisional exhibiting artist members who participated in the 2017 Carolina Artisan Craft Market in downtown Raleigh, NC. Check back in August 2018 for an updated list of participating artists in the 2018 Carolina Artisan Craft Market. Click or tap on the image to learn more about your favorite artist.